Anyone Can Install Custom Made Wood Blinds! So you’ve purchased your brand new wood blinds and you’re ready to beautify your home! One of the major selling points for wood blinds is how easy they are to install. They can dramatically change the look of a room, without a lot of effort or money. They can add just about any type of effect that you like to a given room. But they are most often used to give a feeling of warmth. The natural look and texture of the grains make you want to enter a room and stay there for a while. All you will really need is a screwdriver, a cordless screwdriver, or a drill with the appropriate drill bit. Start your installation by first positioning your first bracket at the top corner of your window frame, being sure that you have the right side away from the glass. You will clearly want the open side facing away from the window, so you can slide your blinds right in there. For easy installations, it’s probably best to slide your brackets all the way to the front of the window sills opening. You can make things easy on yourself by creating some starter holes before you start drilling or screwing. Just put the appropriate screw in place, in the correct hole, and lightly tap with a hammer to get things started. Do this to any two of your side bracket holes. Now use your drill or screwdriver to fasten two of your screws inside of the bracket. Install your left and right side brackets, and any other ones your blinds may have come with. Be careful not to over tighten. Next, snap the included valance clips onto the front of your headrail before mounting the blinds. Remember to space these valance clips evenly. You also obviously want to avoid any contact or interference with any mechanism at the top of the blinds. Now slide your head row into the brackets. This should go and easily. No close the covers on your brackets from top to bottom, making sure they are in their securely. They should snap into place when done correctly. Now snap the valance into place, from the top to the bottom. Next, you should lower and test your blinds, to make sure everything is running smoothly. Thinking About Buying Wood Blinds? 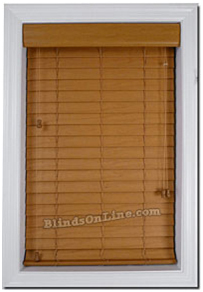 We offer the lowest price on wood blinds or any other type you may need. We offer a price match program, up to $500.00. So there’s no need to shop around, and we accept Paypal. You can click here to browse what we have.